Cove Rangers can now turn their attention to the SPFL pyramid play-offs, where they will hope it is third time lucky in their bid to join Scottish football’s top four leagues. 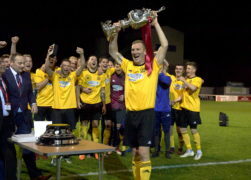 Cove Rangers were crowned Highland League champions for the seventh time on Saturday after a narrow but thoroughly deserved victory at a breezy Mosset Park. A share of the points was just about right as Buckie Thistle held Nairn County 2-2 in a thoroughly entertaining encounter at Station Park. 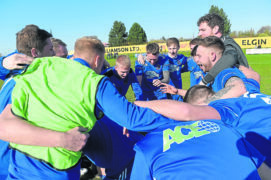 Cove are a step closer to retaining their title, but they had to call on all their expertise to stretch their lead over 10-man Wick Academy, with three goals in the final three minutes. Cove continued their march towards the Highland League title with a straight-forward win over Fort William. Formartine United manager Paul Lawson has urged his players to show him they deserve a cup final starting place when United face Strathspey Thistle at North Lodge Park tonight. 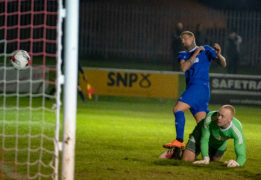 Cove Rangers took a giant step towards retaining the Highland League title by coming form behind to earn a hard-fought 1-1 draw at Dudgeon Park. Cove Rangers moved a step closer to retaining their Highland League title by avoiding defeat at closest rivals Brora Rangers. Buckie Thistle goalkeeper Lee Herbert is hoping to get the nod to start for Scotland against England in tonight’s schoolboys international at Harlaw Park in Inverurie. Brora Rangers player-manager Steven Mackay accepts that anything less than three points at home to leaders Cove Rangers on Saturday will almost certainly end the Cattachs’ title hopes. Cove Rangers’ signing of experienced midfielder Martin Scott following his release from Cowdenbeath last week could lead to protests to the SFA and SPFL from League Two clubs. Formartine United have booked their place in the Highland League Cup final with an impressive win at Brora Rangers. Cove Rangers have confirmed that honorary club president Alan McRae is to be honoured by having the main stand at Balmoral Stadium named after him. Paddy Boyle claimed his first Peterhead goal by scoring the winner against Elgin City as the Blue Toon stretched their lead at the top of League 2. The race for the Highland League title is very much alive after Cove and Brora battled out a highly entertaining goalless draw at Balmoral Stadium. Formartine United lifted the Morrison Motors (Turriff) Aberdeenshire Shield for the first time in their history with a convincing victory over Banks o’ Dee at Balmoral Stadium in Cove last night. The number of young people from the north registering their interest in signing up to the Anthony Nolan Trust has increased by 117 in the past year. Banks o’ Dee go into the Morrison Motors (Turriff) Aberdeenshire Shield final hoping to make it fifth-time lucky. Formartine United are aiming to win the Aberdeenshire Shield for the first time in their history when they face junior outfit Banks o’ Dee in the final at Cove’s Balmoral Stadium tonight. Rothes have signed Clachnacuddin midfielder Fraser Robertson on an 18-month deal for a nominal fee. Peterhead and Elgin will be without fixtures this weekend after the cold weather forced three League 2 fixtures to be called off. Today marks the 60th anniversary of one of the most famous Scottish Cup shocks of all-time, and the greatest ever result for Fraserburgh. Fort William have sacked manager Kris Anderson.